If you attended a recent community meeting about the Prince George’s County Zoning Ordinance and Subdivision Regulations Rewrite, then you can probably recall a presenter (or two) mentioning that zoning and subdivision impact everyone. It’s true! Zoning, the regulation of land use, is one of the most important functions of County government. Subdivision, or dividing tracts of land into developable lots, is also important in many ways. Community members are surprised to learn that zoning laws establish fundamental aspects for our neighborhoods like sidewalk widths, building heights, and public notifications. In our upcoming series, the ABCs of Zoning, we will explore everyday things and places that are influenced or impacted by these regulations. Be sure to visit our blog daily for updates and special announcements. 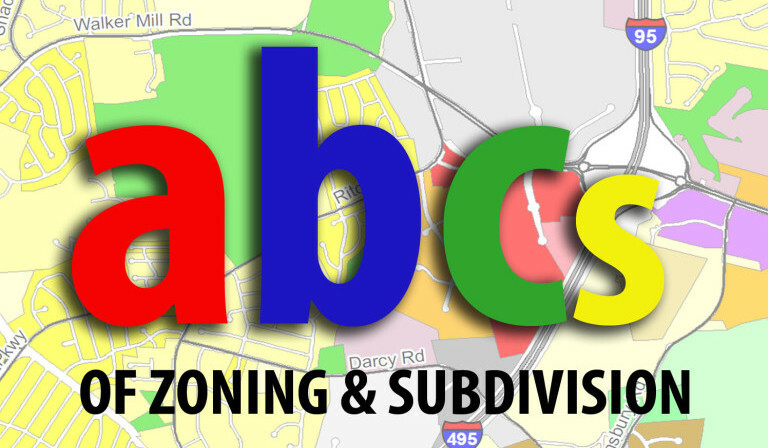 Read the ABCs of Zoning!